Back-to-school shopping and heavy tourism months in Michigan are to thank for a solid July sales month, according to the monthly Retail Index. “As you’d expect in July, northern Michigan tourist towns saw a big leap in sales,” said James P. Hallan, President and CEO of Michigan Retailers Association, which conducts the monthly Retail Index survey in cooperation with the Federal Reserve Bank of Chicago’s Detroit branch. Traverse City participants, for example, say they doubled sales from June, while Gaylord and Marquette retailers both reported increases of 67 percent. Such sales increases is one reason why retailers prefer that local districts delay the start of school until after Labor Day, giving families more time to enjoy summer activities and boost Michigan’s economy. Michigan Retailers Association supports a post-holiday start and promotes local shopping through its Buy Nearby campaign, which educates consumers to “Keep your money in the Mitten.” Buy Nearby Weekend is Oct. 5-7. In July, 46 percent of respondents reported sales increases over June, the survey showed. Twenty-nine percent of retailers recorded declines in July and 25 percent reported no change. 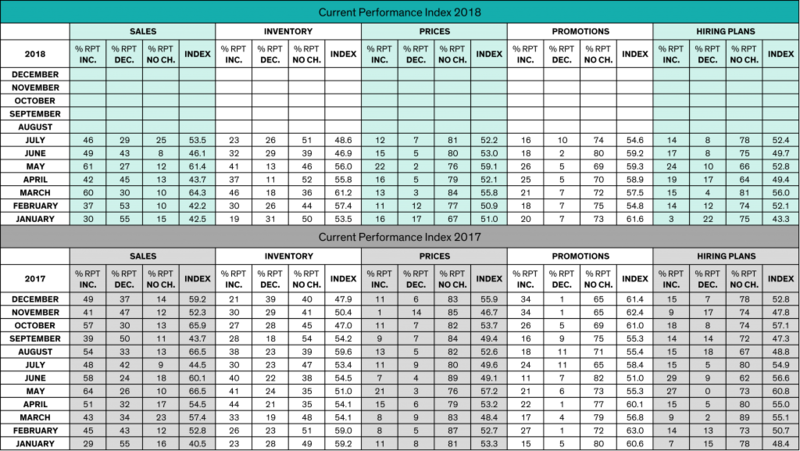 The results create a seasonally adjusted performance index of 53.5, a leap up from the 46.1 performance index reported in June, making July one of the stronger sales months in 2018. A year ago, the Retail Index was 44.5. The 100-point index provides a snapshot of the state’s overall retail industry. Index values above 50 generally indicate positive activity; the higher the number, the stronger the activity. Another boost for July sales is shopping for school supplies and clothing. The last weekend in July often is the busiest time for back-to-school shopping , says the National Retail Federation, which projects that families will spend an average $685 on such purchases. The Retail Index shows that 67 percent of Michigan retailers expect strong sales through October, while 16 percent predict a decrease and 17 percent expect no change. That results in an adjusted outlook index of 76.2 – a good sign for a strong finish to summer and beginning of fall. Michigan’s jobless rate fell two tenths of a percentage from June to July, standing at 4.3 percent. The national rate is 3.9 percent. A year ago in Michigan, it was 4.5 percent. According to the Senate Fiscal Agency, July 2018 sales tax receipts were up 1.7 percent from fiscal year 2016-17. Note: William Strauss, senior economist and economic advisor with the Federal Reserve Bank of Chicago, can be reached at 312.322.8151.